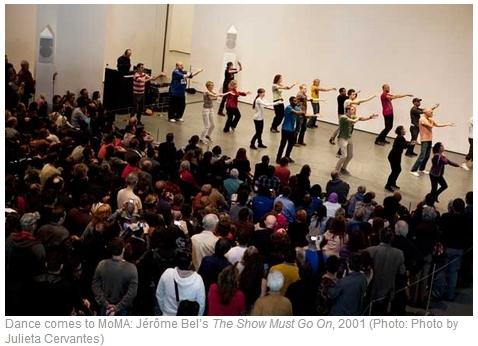 Helen Stoilas writes in The Art Newspaper how more and more museums are focusing on performance, particularly dance, in their programming to revitalize the experience of their visitors. What do you think about this trend? How do the principles of slow looking relate to art that is time-based or performed live? We would love to hear your thoughts. I think there can definitely be a “slow art” component to performing arts. I recently attended a lecture by the experimental theater director and choreographer Robert Wilson, whose work is all about playing with the ways in which we see, hear, and experience art. Anyway, he said something during his talk which stuck with me: “If you would like to hear something better, close your eyes. If you would like to see something better, turn off the sound. And then you will understand.” I think that even with time-based works of art there’s a place for the slow art experience if we get ourselves into the right mindset for it. I think in terms of performance art, the act of ‘looking’ slowly turns into immersing oneself in the performance piece; getting the most out of it that is allowed under the circumstances. This could involve all senses, not just sight- given the piece is performed by other beings with the ability to appeal to those senses. I think performance art has the potential to open up the experience of art to a new range of possibilities that could change the way one classifies art as merely an ‘object’.